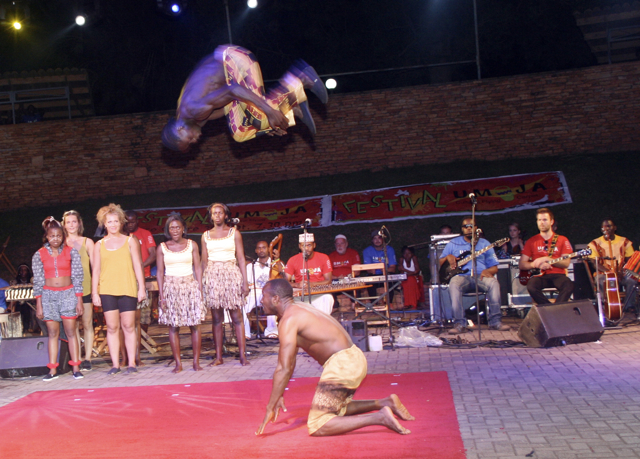 They stormed the stage with the energy of fighter bulls, the nimbleness of rabbits and the coordination of ants, in the first International Umoja Cultural Flying Carpet Show in Uganda. The avant-garde performance kicked off at 7:30pm on Friday September 30th 2011 in the Ndere Centre amphitheater, so peopled the latecomers could hardly find standing spots. Dancer Ken Sewanyana from the Ugandan group. In a country of over 30 million people from diversified ethnicities that rarely get along in life as on stage, it was reassuring seeing blacks and whites synergize through music, dance, circus and acrobatics – their tribal and cross-border differences forgotten. But then again, this is what Umoja is all about. As is evident from its slogan of “Creating together”, it has since 2003 brought together gifted young artists, teachers, administrators and professional performers from different countries, with the goal of enhancing respect and understanding of each others cultures. 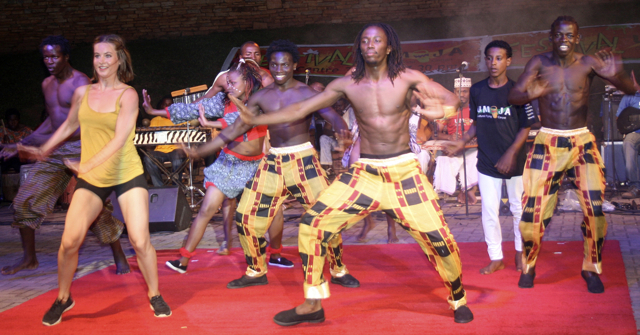 The Kampala shows had national ensembles from the countries of Uganda, Kenya, Ethiopia, Tanzania and Norway – to the overall tune of 80 artistes – who excelled during the May auditions to earn themselves performance slots in this year’s festival. 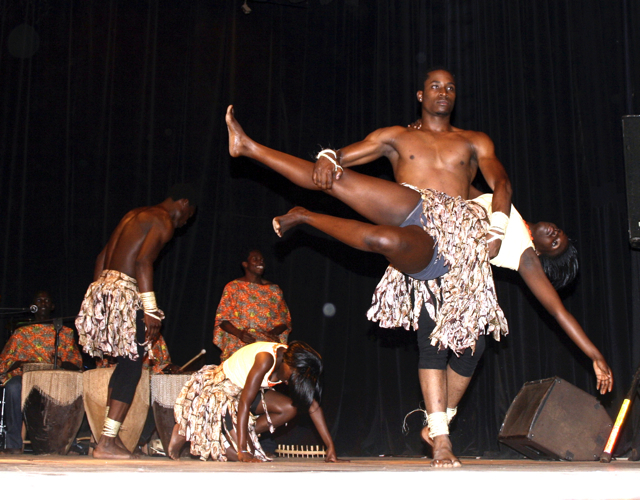 From the Ugandan performance at the National Theatre 2011. Just minutes into 7pm, the atmosphere at Ndere Centre was inviting; whispery talk among goers, lights dancing serenely across the stage, artists fine-tuning their instruments and overhead in the moonlit sky stars blinked expectantly. At 7:30pm joyful noise accompanied the colourfully costumed and painted dancers on the stage. The welcoming piece, a collaborative effort between the hosts Uganda and project sponsors Norway, was a traditional dance called “Ekizino” from the Bakiga of south western Uganda. From the Umoja International Show 2011. The adage goes there is no dance until the fat lady has danced! And the “fat” lady this time was a Norwegian girl of relative build, whose stage zeal and skill and appeal basically took her partners back to elementary. Don’t get it all wrong; the others were good too. With percussive instruments to spur them, sweat poured out and drenched their costumes, the ground shook with their energy, the lead singer’s voice reverberated like super subwoofers and the spectators stood up spellbound; torn between jumping or clapping or shouting. 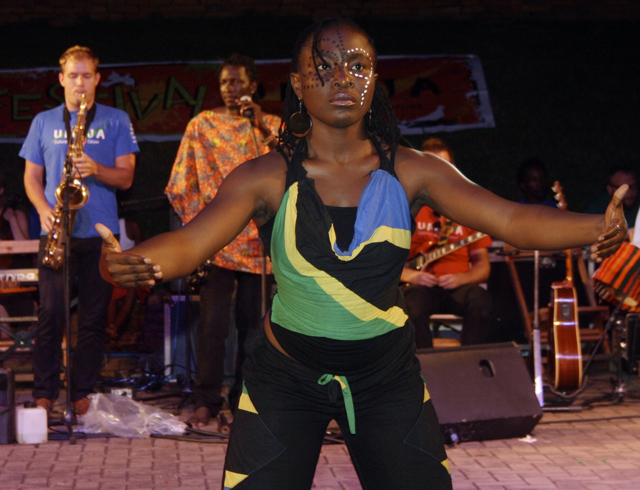 Dancer Maria Fidelis Msafiri from the Tanzanian group. Watching the Norwegians flying adroitly to the “Ekizino” rhythms captured the significance of this festival like no other explanation would. How would they have learned this without Umoja coming to Uganda? The whole spectacle brought back the words of former Mozambique Education and Culture Minister, Aires Ali, on essence of Umoja: “Culture will not develop only on its own premises, it has to mix and meet with other cultures”. The next showcase was called Reaching Out to the Sky, an instrumental production created out of drums, xylophones, bass guitars, rattles, tube fiddles, trumpet and violin among other traditional and exotic instruments. As the jazzy sounds warmed up the air, the acrobatics dived onto the stage doing their clever tricks much to the excitement of the audience. The Ethiopians are the masters of showmanship in this category as were at circus. Their supple bodies seemingly contained no bones. They juggled hats and clubs and dived through bicycle rims so dexterously the audience gasped in fascination. 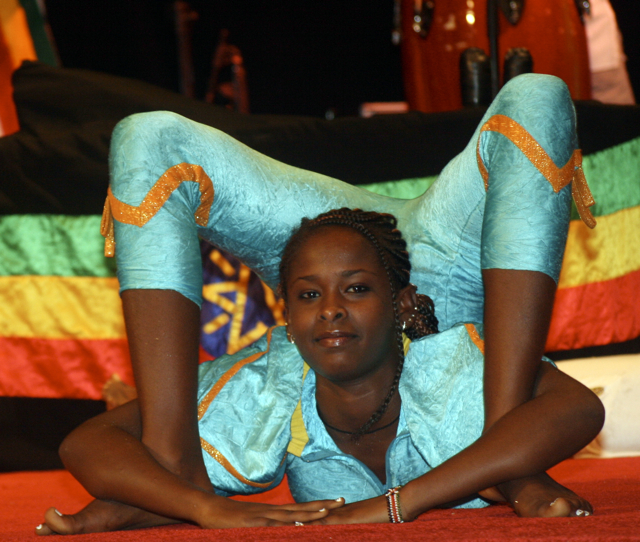 Contortionist Fasika Zerihun from the Ethiopian group. Part of the acrobatics included making a human tower that kissed the high heavens and rare gymnastics that had the emcee begging the audience not to try this at home. Although the acrobatics were painted, they were sagacious not to subject the audience to the clichéd bulbous red noses, swallowing flames of fire and bumbling as have defined the few circus clowns and acrobatics in Uganda. 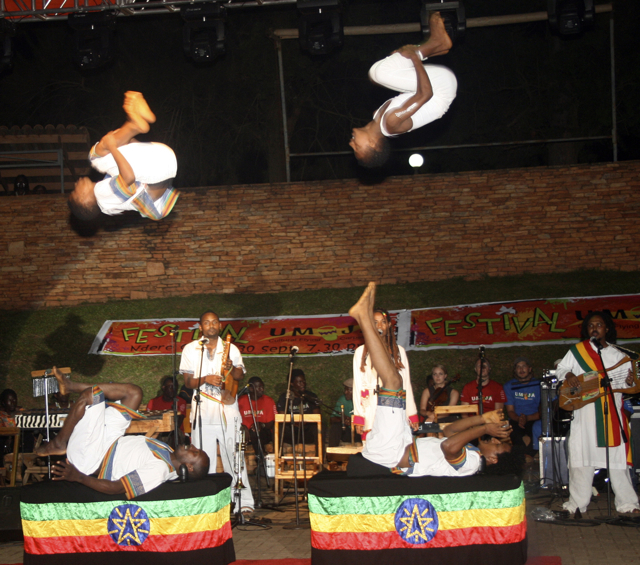 The Ethiopian acrobats performing at the Umoja International show 2011. The circus and acrobatics were resoundingly received probably because never before had Ugandans watched something as hilarious as it was professionally executed. The art of circus in Uganda has struggled to find acceptance even though the country has an eclectic performance and cultural life. Not that there have been many circus shows here. 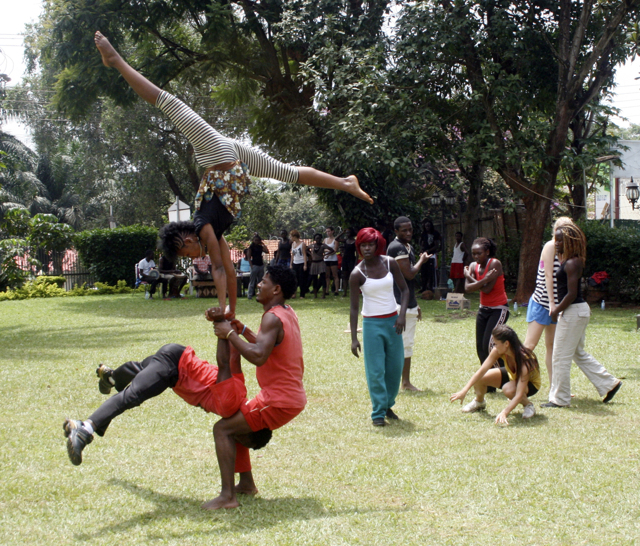 Alliance Française, Kampala and the Ugandan German Cultural Society have in the past organised circus performances that have featured international circus artists like Germany’s Mareike Moerschen and Sylvain Bernabe from France. But all their clowning, juggling and dancing on ropes and overall foolery, though spectacular didn’t hook Ugandan artists to embrace this art form. 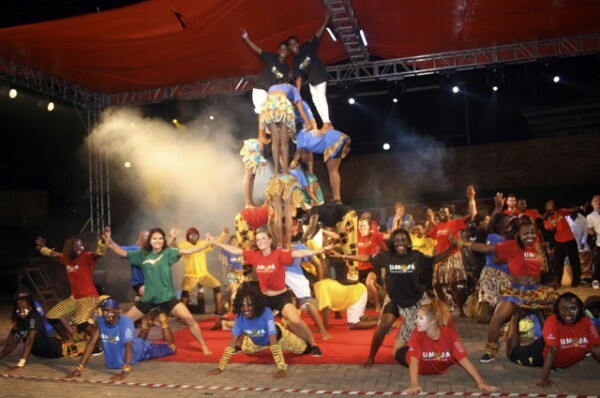 But the Umoja festival raised the bar in circus performance that is guaranteed to provoke Ugandan artists to take to circus as well and make it relevant to fun-loving Ugandans who are always hankering after mirthful weekend preoccupations. Should this happen, Umoja will have fulfilled one of its mandates – nurturing and promoting new acts for the greater good of the performing arts industry the world over. Yes, that was the name of the act and it was as hilarious as was the circus – the perfect comic relief provider. The performers drew hearty amusement from the audience by the way they dramatised animal movements and sounds. They chirped like birds, mooed like cows, hissed like snakes, roared like lions, meowed like cats, and more such animal noise while they made wild sweeps across the stage like real animals. More hilarious was the monkey dance. You would think the performers had lived a while in the jungle mastering the language and mannerisms of animals. In the audience was Norwegian ambassador in Kampala, Thorbjorn Gaustadsaether, a professed man of the arts who introduced the project to Uganda. Umoja is supported by the Norwegian Ministry of Foreign Affairs, and having probably been captivated by the vibrancy of our performing arts, His Excellency Gaustadsaether contacted the Performing Arts and Film Department at Makerere University, which instantly snatched this opportunity to coordinate the festival in Uganda. 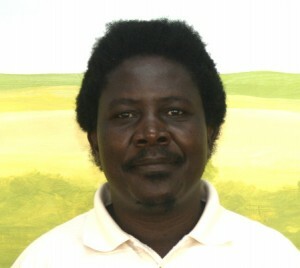 Patrick Mangeni, Ugandan Umoja Team. 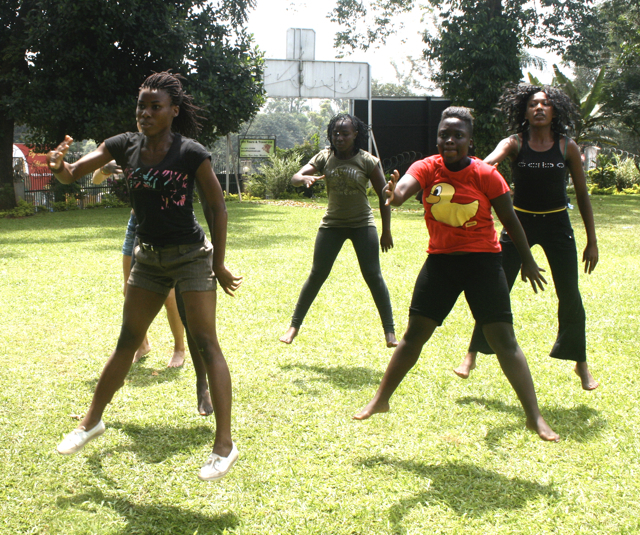 “It was an opportunity for us as a department to fulfil some of the functions of being able to have outreach programs; there’s a lot to learn from collaborations with other artists and choreographers from Uganda and East Africa,” Dr. Patrick Mangeni, Head of the Department at Makerere told startjournal.org. When the emcee invited the Ambassador to greet the audience, he was visibly excited as he lauded the performers for the “fantastic show,” and enthused about the relationships and friendships the festival had created. That he was accompanied to the stage by Uganda’s Minister of State for Gender and Cultural Affairs, Hon. Rukia Isanga Nakadama, was a big statement on the ability of the arts to forge unity and harmony between totally different countries, and go on to enjoy an interdependent relationship. “I’m too proud because this is the first time [the Umoja festival] in Uganda and this is unbelievable,” Hon. Kakadama said, having been blown away by the performances. Just before, Tanzania’s vocal heartthrob, Carola Kinasha stepped onto stage accompanied by singers from the participating countries. She was elegantly clad in a colourful “Kitenge” from a Zanzibar-based designer, complete with headgear. Soon her vocal prowess got many off their seats to sway contagiously along with the songbird. Kinasha’s song was a new creation and at the end of it all, the audience were heard pleading for me. What got was a climaxing act, a common traditional folksong from Buganda called Tweyanze (we’re thankful) given a fresh touch by a fusion of bass guitar, drums and bits of dancing from more than 15 performers. The message of the production was spot on –thanking people who came and those who watched from home because UBC TV did broadcast the show live. 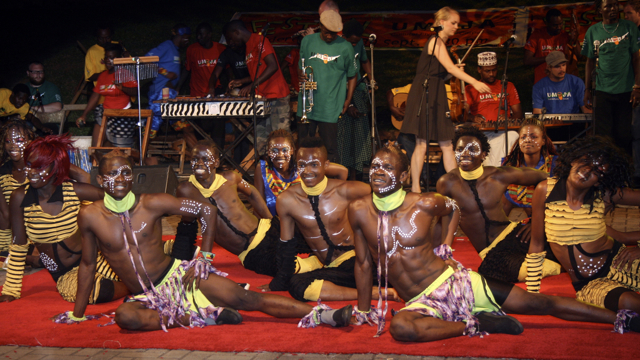 The Kenyan group performing at the Umoja International show 2011. Soon, everyone from the entire ensemble of 80 artists was on stage, like one big family and each got busy giving us snapshots of their expertise and finesse. They circled the stage and embraced and danced with such chemistry, and looks that seemed to say it was sad the show was over. 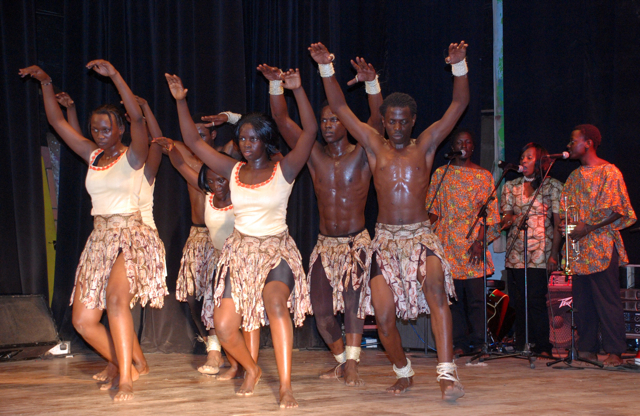 From the Umoja International Show 2011, the Finale. It’s about then that explosions went off; phenomenal fireworks display that served as a deserving conclusion to the phenomenal display of talents. It had been a mastery stroke; getting so many artists and diving them into different production units that put together everything from scratch. New music, new choreography, new acrobats and circus, yet also get a chance to see individual country performances. All pulled off with such admirable coordination and symbiosis that the audience didn’t have reason to yawn. The show was a success because Umoja’s overriding idea of creating together was fulfilled. Umoja group performance at the Ndere Centre September 30th 2011. But when the lights went out at Ndere at 9pm, and the masses found their way home, was that it? 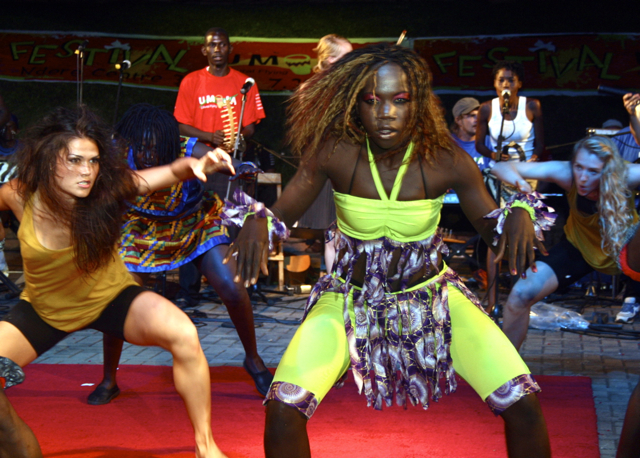 What lasting implications did Umoja International Festival have for the host country and indeed for the whole arts fraternity in Africa and the world? According to umojacfc.com, Umoja Cultural Flying Carpet is all about getting these different countries to work together; promoting local talent and intercultural exchange, which in turn bring about peace and development. But the real benefit is in the sharing of ideas during residential training. Umoja Camp at the Fairway Hotel 2011. The participants in the 2011 edition for example camped at Fairway Hotel in Kampala for an intensive week of learning from each other as individuals and institutions. Each country brought its unique approach to art, so the sharing of their different skills and expertise in singing, dancing, choreography, playing instruments and circus to enrich what they knew is something the participants will continue to draw inspiration from. “The problem with our art is that it seems not to be growing because we are doing it as individuals – as small unit groups almost silently and as privately. But it’s a universal principle that for art to grow you just have to put it out and just have to share it,” said Lawrence Branco Sekarega a music teacher in the Department of Performing Arts and Film at Makerere University, who also participated in the festival as a trainer and performer. 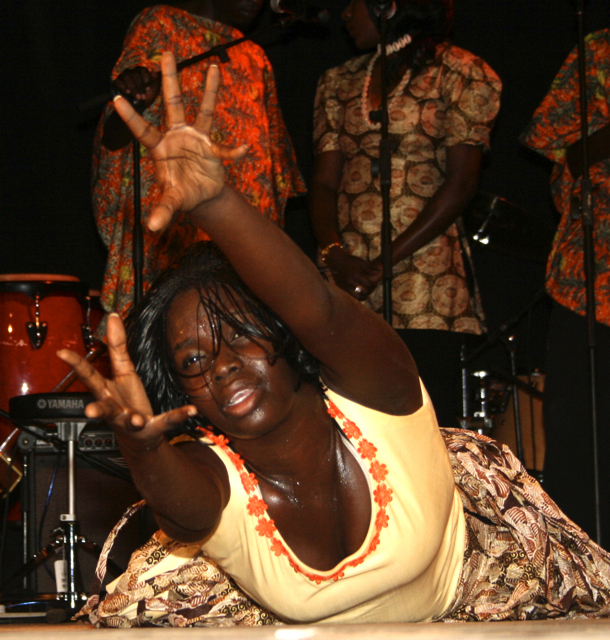 Dancer Esther Apolot from the Ugandan group. The next Umoja festival will take place in Maputo in 2012. 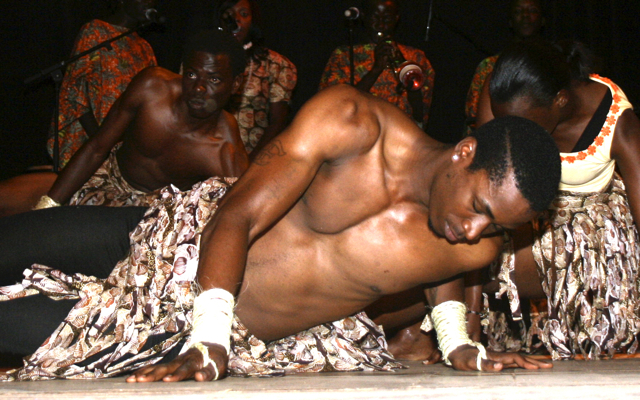 From the Ugandan performance at the National Theatre, 2011. Dennis D. Muhumuza is a Ugandan published short-story writer, scriptwriter and freelance journalist with a profound interest in the arts. All photos by Hanne Dal, graphic designer. 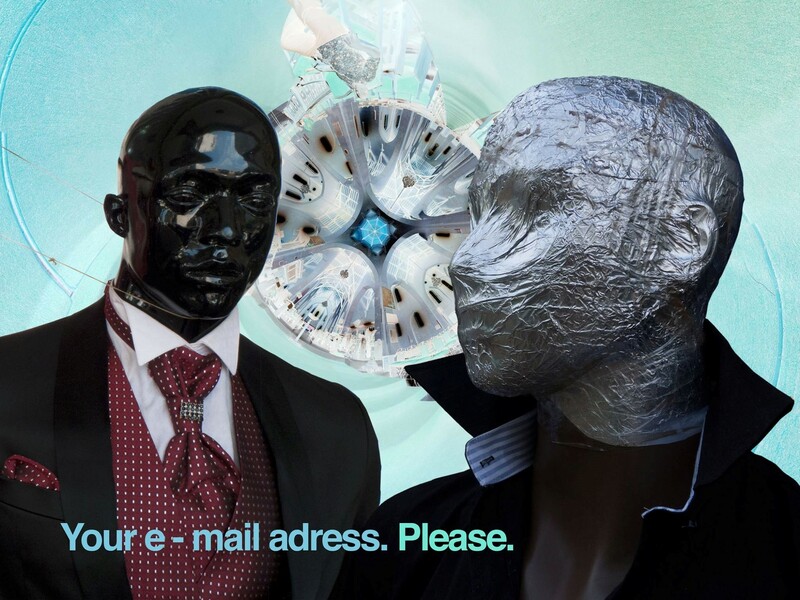 Startjournal.org also wrote an article before the final International Show 2011.